The critical examination of a corpus of retrospective narratives by returned emigrants demonstrates that mémoires and souvenirs written between the late 1790s and 1850 present anachronistic and reconstructed visions of the relation between the emigrant and British communities. 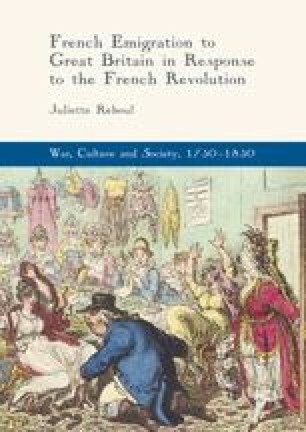 The predominant anti-British discourse of these texts blends in real experience of emigration with clichés and topics inherent to travel literature, eighteenth-century xenophobic discourse and nineteenth century émigré ideology. Descriptions of the host country project the authors’ adherence to France as a patrie and, in later self-narratives, a nation. Despite the retrospective construction of a historical-national consciousness within the returned emigrant groups, self-narratives remain essential to seize the political, cultural and social preoccupations of returned emigrants as well as the narrative formation of a victimized identity.